Interface koto generates animation from koto sounds. WHAT IF PLAYING A MUSICAL INSTRUMENT CAN DO MORE THAN CREATING MUSIC? If some interfaces can allow a musical instrument to create more audio and visual artwork while producing its regular music, could it be a new approach and understanding of a musical instrument, like a multi-sensory instrument? This is how this project started. This project builds an interface system that is attached to a real acoustic instrument and also considers the performability; the performer should still be able to play the instrument as usual when the interface is attached. A koto, Japanese zither, is the instrument selected for this project because the koto is my primary instrument. Here I first discuss the process of selecting sensors that work well with the instrument’s physical nature. After that, the issues and solutions regarding the implementation of the interface system onto the koto is argued. Lastly, I explain how this interface koto is performed: in other words, the composition process and performance from the performer’s point of view is discussed. 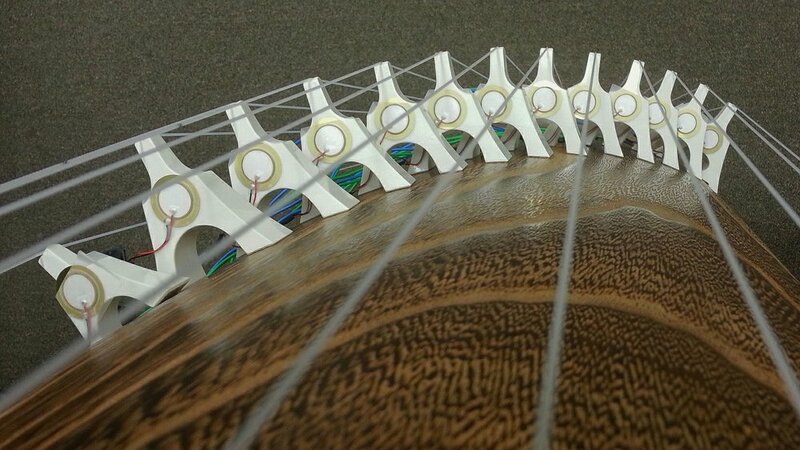 The initial idea was to place a FSR sensor at the bottom of each bridge where a bridge touches the koto body surface, so the FSR can receive different types of pressure when the string is plucked or bent. The expectation was that the sensor receives a quick short pressure when a string is plucked, and when the string is bent, the sensor receives longer pressure, detecting the duration and the level of the pressure of a string-bending action . This idea did not work out for two reasons. First, the relationship between the left-hand bending gesture and the pressure that the bottom of a bridge receives was not straightforward. The bottom of the bridge started receiving the pressure when the string was bent; however, the pressure stayed almost the same even after the string was released. The level of the pressure changed back when the string was plucked again. Though this is an interesting discovery between bending gesture and the pressure that the bridge receives, this shows that the data from the FSR is not related to the left-hand gestures. The second reason is the nature of the koto body. The body of the koto is not lacquered but a raw organic wood. Therefore, the body surface is not consistently smooth. Since the positions of the koto bridges are always different based on the tuning styles, it is impossible to expect a FSR sensor to receive the same pressure in the same way from the same left-hand gesture. This fact makes it difficult to understand how the left-hand bending is performed from the FSR data. Since FSR is not an ideal sensor, Piezo was selected to detect the vibration, instead of the pressure, when the string is plucked. As for the left-hand bending gesture, MYO (https://www.myo.com/) is selected. MYO is a wearable sensor that a person wear on their arm, and the MYO can detect orientation, acceleration, and gyroscope of X, Y, and Z axises as well as EMG data from 8 sensors surrounding the arm. The Y axis orientation is used to detect the left-hand bending gestures. An IR sensor is used to detect the string-scraping technique. The technique is to scratch the two strings next to each other by the right-hand index and middle fingers from the right end towards the koto bridges. The IR sensor is placed at the right end of the koto to detect the distance between the sensor and the right hand. 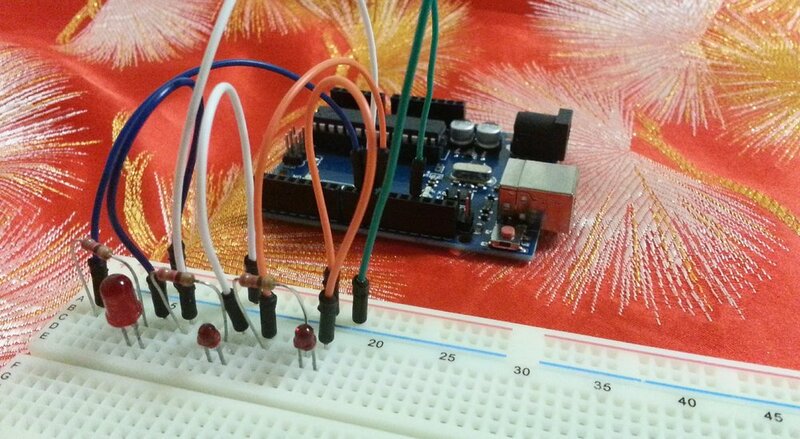 These data received by the sensors were sent to Processing via Arduino, and Processing generates an animation. Piezo sensors were first attached to the original koto bridges with tapes. The primary focus of this point was not to damage the original bridges and that the sensors should be detachable. However, it was soon revealed that the tape couldn't attach the sensors firmly enough to detect the vibration accurately. A couple of different methods were examined with different materials such as rubber bands. However, the results were not successful, and the data received were not useful. The koto bridge is designed for the 3D-printer by Martín Vélez, an awesome artist! In this project, animation is created based on the data received from three different kinds of sensors, Piezo, MYO, and IR, which are used to detect different performance techniques: plucking, bending, and scraping strings. The sensors are tested with the koto and a performer. As the sensors are set on the koto and the performer plays the instrument, the data are observed. Based on the data received, thresholds are set, and the data are mapped in order for the numbers to be useful in Processing. The data from each technique are sent to Processing and generate different types of animation. The animation also generates manipulated koto sounds. As a result, the audience will have an audio/visual experience, including the original koto acoustic sounds. From the performer’s point of view, this interface system does not require much extra caution to play the koto and interact with the interface at the same time. Therefore, the performer is able to focus on their own performance without compromising their performance aesthetics to communicate with the sensors. In this sense, the koto can be the audio/visual multi-sensory instrument with the interface while functioning as the koto as an acoustic instrument. This interface koto project interacts with an acoustic musical instrument performance while the performer maintains the aesthetics of the instrument performance techniques. Playing music is a journey of a performer’s musical idea through their body, the instrument, and the air to the audience. The more smooth and efficient this journey is, the better the performer’s idea is communicated with the audience. The function of the interface system here is to expand the means to transmit performer’s ideas without disturbing the musical process. This project achieved this goal with various technologies such as sensors, Arduino, Processing, and 3D-printing, creating a multi-sensing experience along with listening to acoustic traditional koto sounds. 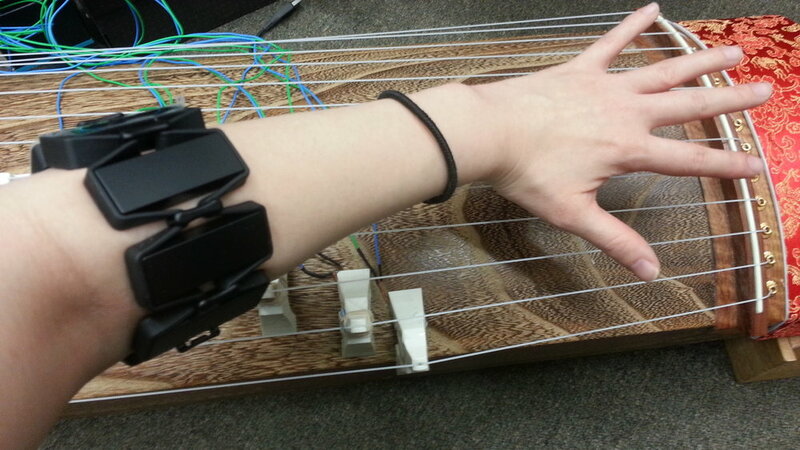 This success was based on a number of close and careful observations of koto techniques, sensor selection, and the data received from performances when the interface and the koto were connected. The project was also successful in a way that the performer did not need to make extra efforts to familiarize themselves to the interface system. Such new effort is itself exciting, and this can be an interesting point to explore for the next project. For this particular one, however, the focus was to have the performer play as usual, or set a human being at the center, and to have the interface system built around. This system did work out in that way. This time, the koto performer created animation through Processing. However, this interface enables the koto performance to do many things depending on artistic ideas and the ways the interface is connected and the data is used. This interface can limitlessly expand the idea of what kind of, and how, art can be created by playing the koto. Future research may be done in the analysis of other koto performance techniques to develop a more comprehensive koto interface system.